« Paul Guzzone!! House Concert!! Occasionally, I will have someone remove their DSP board to send to me for reflashing. I’ve noticed that there seems to be an issue with disassembling the VIP board that was not an issue with the Series 1 Vypyr boards. It seems that Peavey is using a different part for the ribbon connector headers than they used to. While there isn’t anything wrong with these headers, they do have a tendency to pull off of the board when the ribbon cable is removed. If you will look at the picture to the left, you should notice that there are two plastic parts to the ribbon connector. One of these is intended to be a part of the circuit board. It helps to properly align the ribbon cable and make getting all of the pins into the right holes easier. The other part is crimped to the ribbon cable with small blades making the electrical connection. This part then plugs into the portion attached to the circuit card. used to. The result is that if time isn’t taken to separate the glue from the assembly when removing the cable that both parts of the connector come off of the card. 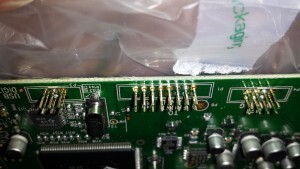 This results in the card having exposed pins as is shown in the picture to the right. Be very careful when removing the ribbon cable to only pull on the plastic connector. DO NOT PULL ON THE CABLE! There are a few issues that arise when the entire connector assembly is pulled off of the circuit board. First, without the guide portion of the connector in place it is very easy to bend and twist the pins on the circuit board. Bent pins are not a good thing. They make it very difficult to reconnect the cable (especially if an attempt is made to plug the entire assembly into the pins. The second issue is that having the guide on the circuit board provides some protection to the pins. This is particularly important if the card is being removed from the amplifier and shipped. If the shipping package receives some crush damage, the guides will provide protection that should prevent the pins from completely breaking off. The third reason for wanting these in place is that they make it easier to remove the cables. 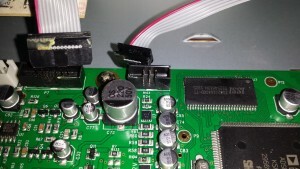 So be careful when removing the ribbon cables from the VIP DSP card to separate the guide portion if the connector from the cable portion. Don’t over-tighten the screws when putting the DSP board back into the chassis. That can crack the DSP board, rendering it irreparable. When sliding the amp assembly back into the carcass (the wooden chassis), slide the speaker wires into the carcass before trying to slide the amp back in. Otherwise you will have to take the amp back out to get to the speaker wires. Don’t forget to reconnect the speaker when you get the amp back in the chassis. You may want to do this before you put the back on the amp. I have a vypyr vip1 that passes no guitar input – aux in thru amp/speaker and thru headphones work fine, but for some reason will not pass guitar input. Flashed to 1.62 and same thing – not a bad flash, but any advice? Sounds line the instrument input jack is broken. This is more than just a 1/4 inch banana jack. Try cleaning the input jack with contact cleaner first. I’m assuming that you get the lightshow when nothing is plugged into the instrument jack and that the light show stops when you plug in an instrument? I am not sure if you are still tracking this post. Hopefully you are. I have a dead vypyr vip 1 amp. The problem occurred while uploading the new firmware (wrong firmware is uploaded). I might be able to bring it back to life but would love to consult with you on how and what exactly i should do. Would you please be so kind to contact me on my mail? I have stupidly flashed the wrong firmware update on my Peavey VYPYR VIP 2 amp. The firmware I flashed should have been for a VYPYR 120watt valve amp. My VYPYR no longer works. Do you have a copy of the binary rom file from the DSP board of a Peavey VYPYR VIP 2 if so could you let me have a copy? I have a the tools to program the onboard flash rom on the DSP board. Many thanks for all your information on your website. I now own a brick, are you still available to flash a Peavey Viper 2 board? I sent you an email on this. What about modifying the Sanpera 1 pedal? Is there a way to put an extra foot switch connected to the 1&2 an a foot switch connected to the 3&4 foot switches? I find it hard to get into the loop mode by trying to stomp on both switches, then I have to stomp it back to aux mode (Which causes the whole Sanpera to rock forward off the ground because they’re really not that stable. )and try over again. I’d rather just be able to hit one switch to activate the two when I need it to switch functions. I have a dead VIP2 and would love to have it revived. Do you still work with these chips? Any information would be appreciated. I do help folks out occasionally with flashing Vypyr ROMS. Where are you located, and how sure are you that your problem is the ROM? I have a dead Vypyr 3 – wrong firmware was loaded (1.59)into it, and it won’t communicate. Is it possible to send the DSP board to you and have the proper firmware loaded? If so, what would be the cost, and where should I mail it to? It would be immensely appreciated! I do this occasionally. You need to cover the postage both ways, and if the reflash fixes the DSP my cost is that you have to buy a CD from a list of three or four inde artists that I will send. Hello, Glen! I need your help, could you write me on my email? Is it possible to send my VIP 1 board to you for a repair please, if you could let me know what the cost might be, I had a bad flash on my vip 1 and its left it dead. Email sent to your gmail account.